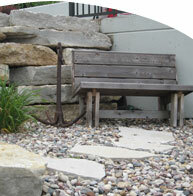 The elegance that a well-crafted stonescape or outdoor structure adds to your overall landscape is undeniable. Master Plan has the vision and creativity to use pavers, timbers, stones and rocks to create truly distinctive outdoor environments. The natural materials we use provide a warmth and depth that can't be achieved with materials like concrete or plastic. We use a large variety of material textures and colors to fit almost any design application. And, just like our landscape process, our hardscaping is a turnkey operation that is most simple and cost effective for our clients. When you truly desire the best, most refined hardscaping -- We'll make you look good!